Speculation about the cause of the decline of lobster populations in Narragansett Bay has focused on an increasing number of predatory fish eating young lobsters, warming waters stressing juveniles, and a disease on their shells that is exacerbated by increasing temperatures. A new study by a scientist at the University of North Carolina points to another contributing factor: Asian shore crabs. The crabs were first observed on the coast of New Jersey in 1988, where they probably arrived in the ballast of cargo ships. They quickly expanded up and down the East Coast — arriving in Rhode Island in 1996 — and they are now found at densities of up to 200 per square meter in the intertidal zones of southern New England. The dramatic increase in the density of Asian shore crabs in the region was followed by a massive decline in the density of green crabs. Green crabs are also not native to the region, having been introduced more than 100 years ago, “but it’s an indication of what the Asian shore crab could be doing to native species,” Baillie said. Adult lobsters live in much deeper water than the shallow intertidal zone inhabited by Asian shore crabs, so the two species seldom interact. But some larval lobsters settle in the intertidal and subtidal zones, which they use as nursery habitat. 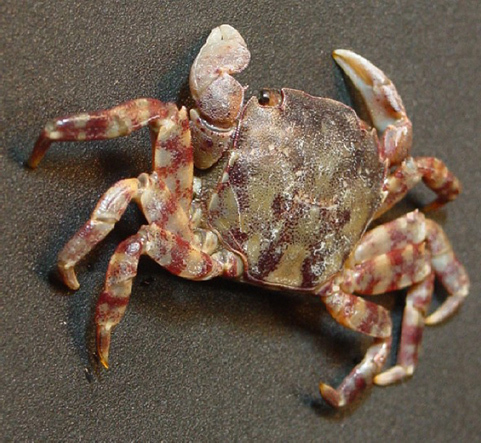 Prior to the arrival of Asian shore crabs, it was an area that had fewer predators and an abundance of food. But now the young lobsters are finding themselves in competition with the crabs for food and shelter. When Baillie surveyed the shoreline in Nahant and Swampscott, Mass., over a five-year period, he found a dramatic increase in the density of Asian shore crabs concurrent with a decrease in the density of juvenile lobsters. He then conducted several laboratory experiments that found that smaller juvenile lobsters lost out to the crabs when competing for food and shelter, especially as the crab numbers increased. In similar tests, lobsters that were slightly larger than the crabs were able to obtain food and shelter, but the lobsters fed more frequently and ate faster in the presence of the crabs. According to Niels-Viggo Hobbs, a lecturer and researcher at the University of Rhode Island who studies Asian shore crabs, Baillie’s research confirms what many scientists have suspected: the crab has a substantial negative impact on young lobsters. Although the crabs arrived in Rhode Island waters at about the same time that lobster numbers began declining in Narragansett Bay, Hobbs said it’s unclear if the crabs were a major factor in lobster decline. The long-term implications of Baillie’s study are unclear, since most lobster nursery grounds are in deeper waters than where Asian shore crabs are found. Unfortunately, there is little that can be done about the invasive crabs. They are occasionally used as bait by tautog fishermen, but not enough to affect population numbers. They are too small to be a valuable commercial fishery. A parasite in the crab’s native range in East Asia is believed to castrate the crabs, rendering them unable to reproduce, but releasing the parasite in local waters would likely cause more harm than good. “It would be incredibly dangerous to go down that rabbit hole,” Baillie said. Baillie hopes his study will at least draw attention to the effects the crabs have and prompt government leaders to prioritize what he calls “fairly simple changes in policies” — like requiring the discharge of ballast water in the open ocean — that could be implemented to prevent future introductions of invasive species to the local marine environment.